Event to celebrate THE WIDOW’S HANDBOOK: POETIC REFLECTIONS ON GRIEF AND SURVIVAL, edited by Jacqueline Lapidus and Lise Menn, featuring readings by contributors Jacqueline Lapidus, Susan Mahan, Ruth Rothstein, Christine Silverstein, Ellen Steinbaum, and Holly Zeeb. 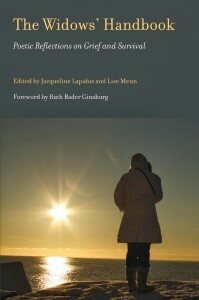 Jacqueline Lapidus (co-editor, The Widows’ Handbook: Poetic Reflections on Grief and Survival), a Boston-based editor, teacher and translator, grew up in New York City and lived abroad for more than 20 years—first in Greece, then in France where she was active in international feminist groups. She holds degrees from Swarthmore College and Harvard Divinity School. Her poems have appeared in numerous periodicals and anthologies and in three collections: Ready to Survive, Starting Over and Ultimate Conspiracy. She has completed a fourth, Significant Other. Susan Mahan of Weymouth has been writing poetry since her husband died in 1997. She is a frequent reader at poetry venues and has written four chapbooks, Susan joined the editorial staff of The South Boston Literary Gazette in 2002. Her work has been published in a number of journals and anthologies. Ruth Rothstein lives northwest of Boston and works as an editor in educational publishing. She oversees the creation of print and digital language arts materials for K-12 teachers and students. After her husband died, she was initially drawn to poetry as a way of expressing her feelings through images. Efforts to narrate the images helped her find the words to convey her experiences of love and loss. She hopes that jazz lovers all over the world will continue to listen to the music of her late husband, pianist Jacques Chanier. Christine Silverstein lived on Nantucket Island for seven years as a newlywed and 15 as a widow before moving to Magnolia. The year her Police Sergeant husband died, she founded Sustainable Nantucket, a nonprofit organization cultivating the island’s economy while protecting its character. She writes to help weave her grief through her joy for life. She also leads bereavement support groups..
Ellen Steinbaum is the author of three poetry collections, Brightness Falls, Afterwords and Container Gardening, and a one-person playCenterPiece. Her work has been nominated for a Pushcart Prize and included in Garrison Keillor’s Good Poems, American Places. A former columnist for the Boston Globe, she blogs on “Reading and Writing and the Occasional Recipe” at www.ellensteinbaum.com. Holly Zeeb is a psychologist in the Boston area who gardens, cycles, and spends time with family in Maine. Her husband of 49 years died in a biking accident in 2009. Through poetry she is able to see more clearly, to protest, to preserve, and to let go. Her poems have appeared in numerous journals and anthologies and in a chapbook,White Sky Raining.